On Wednesday mornings the United States Botanic Garden hosts children between the ages of three and five to come with a parent, grandparent or care giver and learn about the magical world of plants. The program, called Sprouts, engages children in the natural world and gives them basic lessons in plant science. One such lesson features a tree, maybe unknown, but beloved by many, Theobroma cacao, the source of chocolate. Children learn how this tree produces a flower that goes to seed and how these seeds are the source of chocolate! Several months ago during this lesson there were ripe pods that had just been taken off the tree allowing them to inspect a real pod, verse a model. The children were invited to try their hand at horticulture and plant a seed and take it home. Cara took the challenge and three months later the picture above arrived in our mailbox. 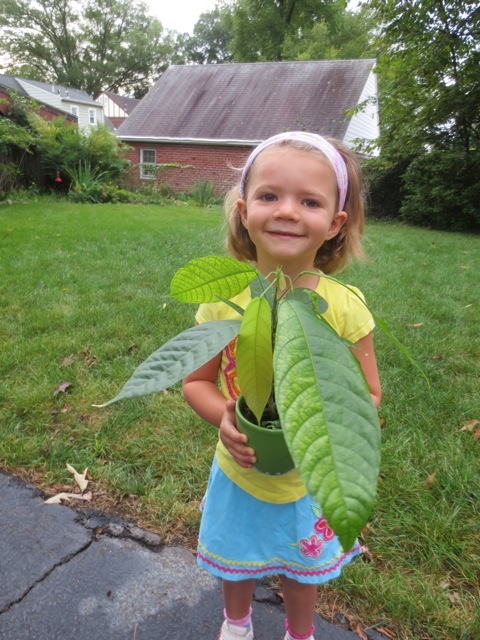 With the excitement and wonder on her face, maybe we have future plant scientist or horticulturist in our midst. For a complete calendar of events at the U.S. Botanic Garden, including future Sprouts, visit: http://www.usbg.gov/programs-and-events.